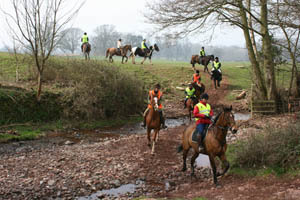 Pony Trekking on the Trails in the Black Mountains..
Pony Trekking is prefect for novices and non-riders who want to go horse riding in Wales and enjoy the stunning scenery and countryside we are lucky enough to live and work in. 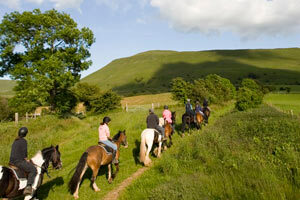 Pony trekking is undertaken at a walking pace, and once you have got used to your pony or horse, the occasional trot. You will be accompanied by one of our experienced and qualified staff, who will guide you around some of the many trails on the Black Mountains. 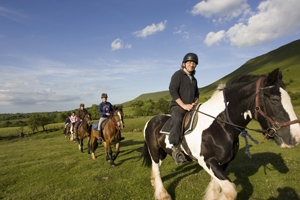 As we have direct access to the mountains from our centre, our rides involve little roadwork and we ride on the open commons and lower hillsides of the Black Mountains and through woodlands and forestry. A perfect way to enjoy our beautiful countryside and see the birds and wildlife of the Brecon Beacons National Park. After introducing ourselves, the day starts with registration and the fitting of an approved riding hat. We then give a safety talk and a riding demo, where you will be shown the basics of approaching your horse, getting on and comfortable, how to start, steer and stop, and at the end of the ride, how to get off again, as well as advice on going up and down hills and getting along with your pony or horse. We provide the use of Riding Hats and recommend that you wear shoes or boots with a small heel and comfortable full length trousers, such as walking trousers. If you do not have suitable footwear, we do have ‘Toe-stoppers’, which are fitted to the stirrups, so you can even wear trainers, so long as they are a snug fit on your feet and laced up securely. Flip flops and other loose fitting footwear are not suitable. You can choose from an hour’s ride, a half-day ride, about 2 hours riding or a full day ride, which is about 4 to 5 hours riding, with a stop for lunch, (included) at a local pub or a picnic stop out on the mountains. We advise you to call us and speak about your experience, height and weight at the time of booking, to help us match you to a suitable pony or horse and the right sort of ride for you. We have a recommended weight limit of 15 stone and do have recommended minimum ages for children. Please call 01497 847351 or e-mail info@tregoydriding.co.uk to discuss your horse riding requirements. For Group Discounts for groups of 8 or more, the same rate as children rates applies.